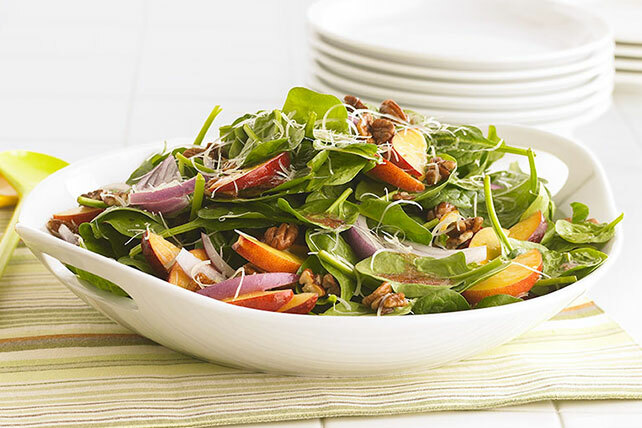 Find out why our Fresh Summer Salad is everything a baby spinach salad should be. Our Fresh Summer Salad is made with nuts, cheese and juicy peaches. To keep the sliced fresh peaches from turning brown, toss in a separate bowl with 3 Tbsp. of the dressing, then add to salad. Get closer to your daily requirements for fruits and vegetables by including this side salad with a balanced entree. Makes 10 servings, 1-1/4 cups each.